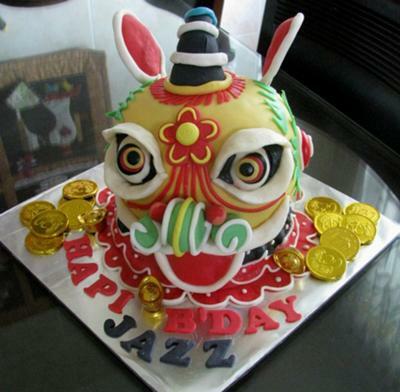 This 3D lion dance cake was baked for a client's son's 3rd Birthday and also for the celebration of the Chinese Lunar New Year. I baked a ball cake and a 1/2 ball cake. Cream the cake with buttercream then the ball cake stake on 1/2 ball cake. Using wooden chopsticks to secure the cakes then cover them with rolled fondant, I started from the bottom to the head. The ears and nose I prepared earlier with modeling fondant and let them dry overnight. So far this is one of the difficult project that I have achieved. Lena, that's wonderful! I love it!!!!! !